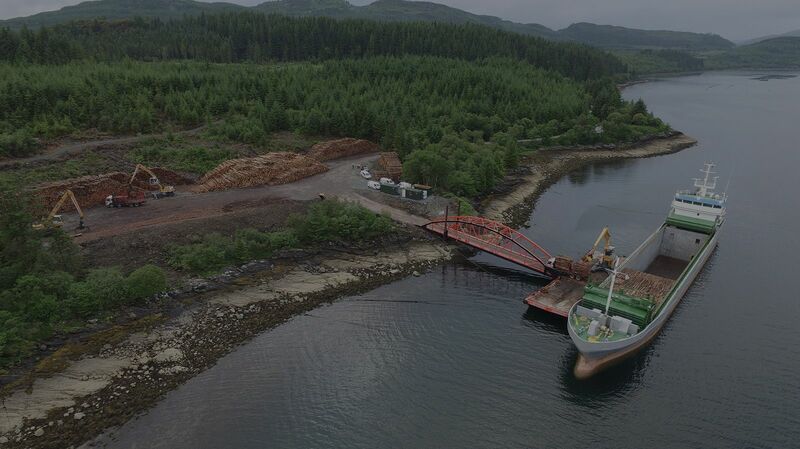 From our base in Southwest Scotland, we operate our fleet of Mobile Cranes, Timber Haulage Vehicles, Timber Handling Vehicles and Mobile Port Handling Cranes for clients in the UK & Ireland. Our unique mobile floating piers can be used to create a temporary access to remote shores. JST Services operate an up-to-date, state-of-the-art Timber Haulage fleet. We provide port handling solutions to Ports /Factories and Plants with no, or limited, handling equipment. JST operate our own ships, providing whole solution packages if required (shipping, handling and haulage). Multiple wheeled Low Ground Pressure Inforest and specialist Site vehicles can massively reduce ground pressure. Our mobile devices can allow tanks to be cleaned, custom grabs can be engineered for the task. Our operators have built up a high degree of experience, skill and efficiency operating our Liebherr fleet.